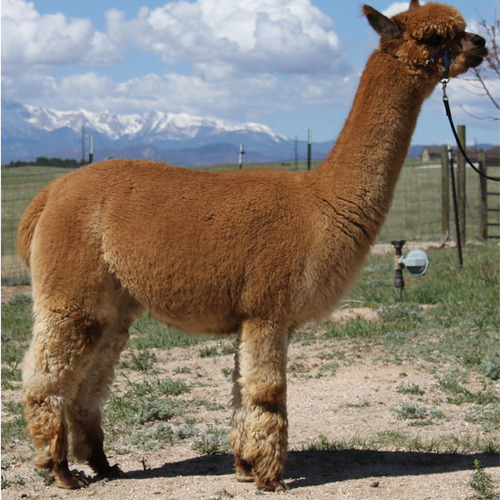 Monarch took a first at the 2003 Great Western Alpaca Show in the white male 2 yr. old class and a 3rd at the 2003 Estes Park Wool Market Fleece Show. He was a dense crimpy white with a soft handle. NancyB is a 14 year old bay black with white markings from the Drambuie and Karrington lines. Her offspring have all had excellent confirmation and soft dense fleeces. 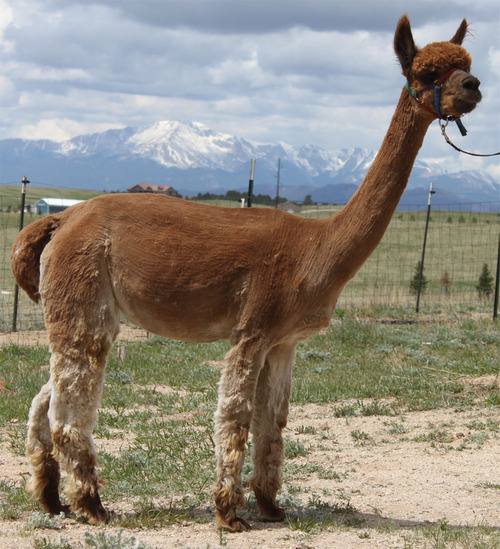 She has produced crias in a variety of colors, including white, grey, fawn, and black. He daughter, Biljana took first in her class at the 2007 GWAS level V halter show. NancyB is our herd matriarch, and an easy girl to handle. She is an attentive mother and very good around people. Wild Hair's Queen of the Nile, known as Cleo, is a lovely fawn female born in 2007. 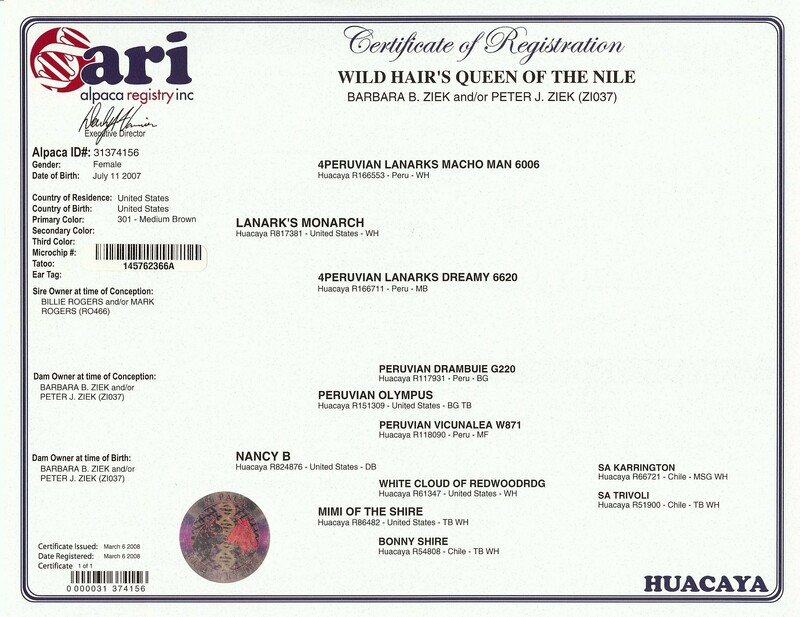 Her dam is NancyB, and her sire is Monarch, a blue ribbob winner at GWAS 2005. She has dense crimpy fleece with a very soft handle. Cleo is a sweet girl and easy to work with. She has been an excellent mom, producing lots of milk and attentive to her cria. She will be a great addition to any herd. Cleo has had two crias for us. The first is a beautiful light brown male with lovely dense soft fleece who has always placed when shown. The second is the result of a breeding to Snomass Shahtoosh N Technicolor that she delivered on 8/9/2014. This was a very bright white female weighing 17.2#. The cria, named WHA August Moon exhibits excellent brightness, fineness, and density. 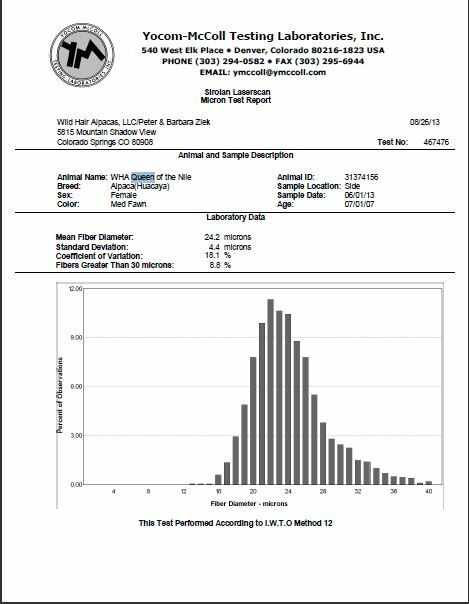 Cleo's histogram for 2014 was AFD: 23.3, SD:4.5, CV: 19.6, and 6.8% over 30 micron. This was as a 7 year old breeding female, so she is holding her fineness. Her crias are also exhibiting the same fineness retention. Her 2017 fleece histogram was AFD: 25.1, an SD: 4.8, and a CV of 19.3.